New Caledonia is a group of islands located in the South Pacific Ocean. New Caledonia is east of Australia and southeast of Papua New Guinea. The islands have been governed by France since 1853. In 1998 the Noumea Accord was signed, giving New Caledonia gradually increasing governing responsibility. 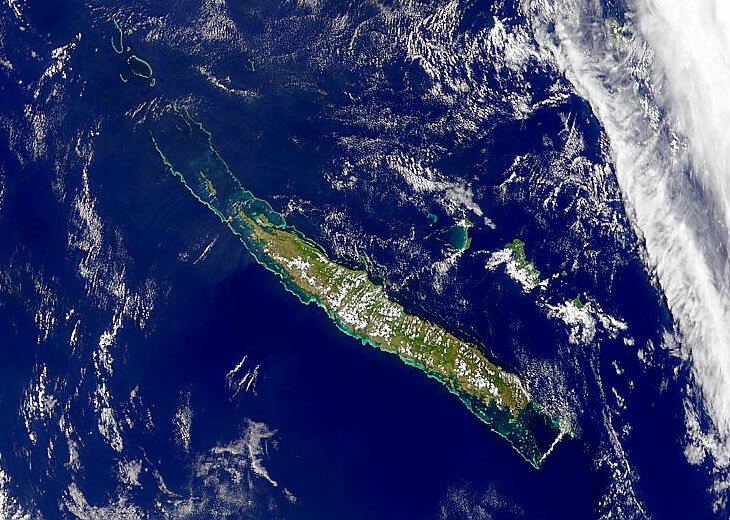 On November 4, 2018, an independence referendum was held to decide if New Caledonia would become its own independent country. Fifty-six percent of the people voted to remain part of France. However, there may be another referendum held in the year 2020. Google Earth is a free program from Google that allows you to explore satellite images showing the cities and landscapes of New Caledonia and all of Oceania in fantastic detail. It works on your desktop computer, tablet, or mobile phone. The images in many areas are detailed enough that you can see houses, vehicles and even people on a city street. Google Earth is free and easy-to-use. New Caledonia is included on our Blue Ocean Laminated Map of the World. This map shows a combination of political and physical features. It includes country boundaries, major cities, major mountains in shaded relief, ocean depth in blue color gradient, along with many other features. This is a great map for students, schools, offices and anywhere that a nice map of the world is needed for education, display or decor. If you are interested in New Caledonia and the geography of Australia, our large laminated map of Australia might be just what you need. It is a large political map of Australia that also shows many of the continent's physical features in color or shaded relief. Major lakes, rivers, cities, roads, country boundaries, coastlines and surrounding islands are all shown on the map. Poum, Koumac, Ouegoa, Ouaco, Pouebo, Voh, Kone, Hienghene, Poya, Poindimie, Bourail, Houailou, La Foa, Thio, Paita, Dumbea, Noumea, Mont-Dore, Yate, Fayaoue, Ohnyot, Joking, Kejeny, We, Tadine, Wabao, La Roche. North Province (Province Nord), South Province (Province Sud), Loyalty Islands Province (Province des iles Loyaute). Pott, Art, Yande, Neba, Baaba, Balabio, Grande Terre, Ouen, Ile des Pins, Kotomo, Ouvea, Lifou, Tiga, Mare. South Pacific Ocean, Coral Sea, Lac de Yate. A substantial amount of the planet's nickel resources are located in New Caledonia, and exports include ferronickels and nickel ore. Other metal resources include chrome, cobalt, copper, gold, iron, lead, manganese, and silver. Cyclones can affect the islands, particularly between November and March. Mining and forest fires have caused erosion problems in New Caledonia. Copyright information: The images on this page were composed by Angela King and Brad Cole and are copyright by Geology.com © 2018. These images are not available for use beyond our websites. If you would like to share them with others please link to this page. The satellite image was produced by the SeaWiFS Project, NASA/Goddard Space Flight Center, and ORBIMAGE.